What a fun way to welcome the new bundle of joy! The circus theme and neutral colors makes this unique design perfect for girls and boys. 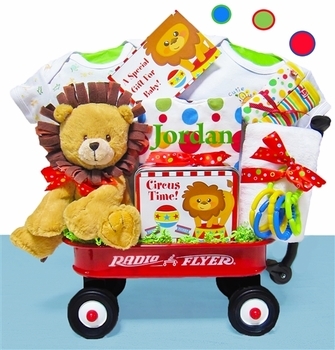 Includes both fun and practical items any new parents will appreciate and makes a great shower gift too! You can also have the cotton bib personalized with an embroidered name for an extra special touch. Original Mini Radio Flyer Wagon - Measures 12 5/8" x 7 5/8" x 2"
This wagon can also serve as a memorable 1st Birthday present too!